VicRoads is reviewing the location of wire rope safety barriers along the Calder Freeway, including offset distances and the frequency of access breaks. VicRoads’ director of safe system road infrastructure program, Bryan Sherritt, confirmed to the Midland Express that the review was being undertaken at the request of the Roads Minister. Elphinstone Fire Brigade captain Andrew Chapman, who has long been critical of the restrictive placement of the barriers and their proximity to the roadway, welcomed the news. 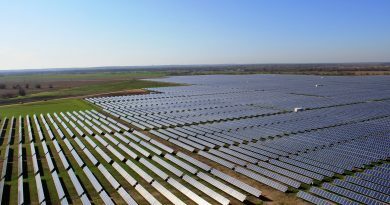 “The sooner the better, here’s hoping that common sense will prevail and hopefully setbacks will be increased,” Mr Chapman said. “There is also going to be an issue with the twin barriers running down the inside of this roadway. VicRoads is also in the process of developing detailed statewide wire rope safety barrier maps, which will include the location of breaks and emergency crossover points. Mr Sherritt said the maps would be compatible with Triple Zero systems to assist emergency services when responding to incidents. 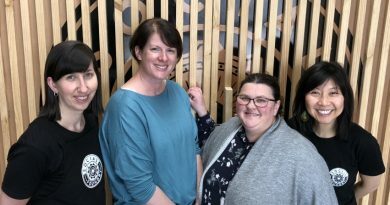 (L-R) Bron Burnett (Social Foundry general manager), Melissa Connors (founder, This Farm needs a Farmer), Claire Rawlinson (Kyneton Community and Learning Centre, community development and pathways coordinator) and Sue-Lee Seng, (Social Foundry front of house manager). 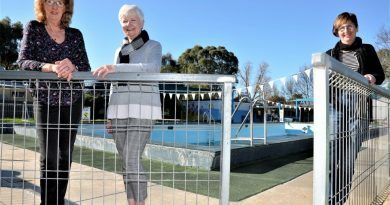 Newstead and District Swimming Pool Inc president Sue Pollard, Bendigo Regional YMCA CEO Jane Robson and Sharon Fraser at Newstead Swimming Pool following last week's council decision.